I wanted my daughter to do something fun and creative with a pumpkin but she's only 18months old so carving, gluing, glittering, and even coloring on pumpkins is not happening. She likes stickers but can't get them off the paper very well yet. No way would I force an activity just to get a good photo and then create a fake post. You guys know I'm not about that. So here's what I came up with!... A sensory pumpkin! How cool would it be to cut the pumpkin's top off and let her just have at it? Get messy with it, or not. Maybe she'd love the slimy and gooeyness between her fingers. Maybe not. And the bonus? Together we took the seeds out and then I roasted them! Dude. The seeds were awesome. I'm def including the spice mix and recipe below. Sure I could have just done some salt but I wanted to try something different. Super happy I did because apparently my daughter loves a well seasoned seed. This activity was easy and painless. She loved squeezing the seeds in her hands and lifting off the pumpkin's top all by herself. It wasn't even that messy because she's not strong enough to scrape the flesh from the pumpkin. Here's a few photos from our morning together! 3. 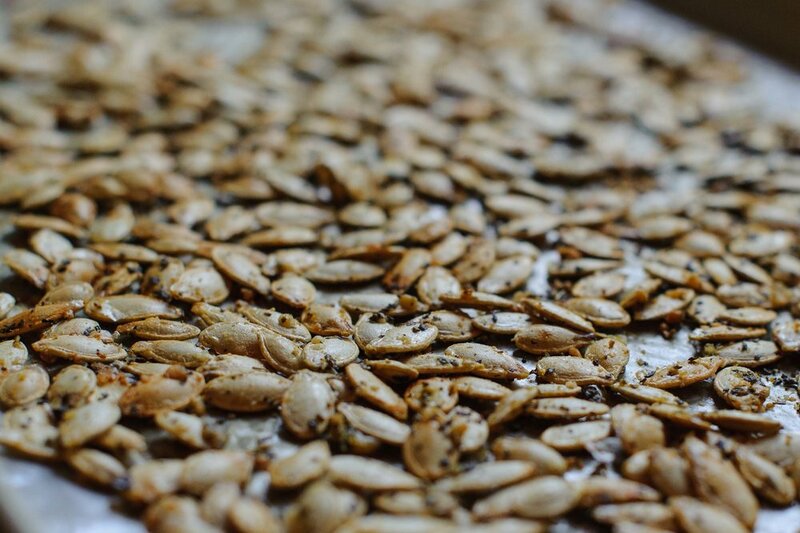 Spread seeds on lined baking sheet. Don't pile seeds on top of one another. Make sure it's basically one layer of seeds so they can breathe and get toasty. 4. Cook for 20-25 min. Toss seeds about half way through. (Mine stuck to paper a little but easily came loose when I gently scraped with a spoon). You'll know they are done when they are a nice golden color. * Roasted pumpkin seeds are a favorite of my 18 month old daughter however I am always supervising her when she eats them and we eat them at the table only.